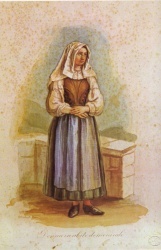 The women's costumes are based the clothes used in the XIX century in Seriana Valley, described in the paintings found in the ancient manuscripts of Antonio Tiraboschi (an expert of local history). 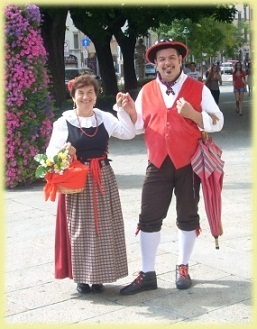 The dress consists of a skirt in cotton with different colors and fancy, often topped with an apron, a characteristic double bodice with multicolored ribbon lacing on the side, white blouse edged with lace. The hairstyle is simple with flowers; during special events a headdress of white cotton, called "Panet", is weared (this element is always present in religious celebrations). 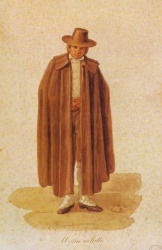 In winter the costume integrates with a woolen shawl of different colors. 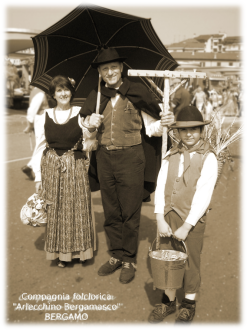 Complete the dress clogs and wooden wicker basket. 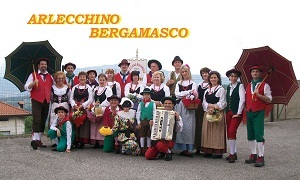 The male costumes are those of Bergamo shepherd, also portrayed by Tiraboschi, with elements of the local mask Gioppino. 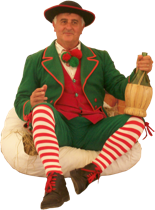 The dress includes traditional rimmed hat, waistcoat in velvet, knickerbockers, long socks, white or striped red / white. 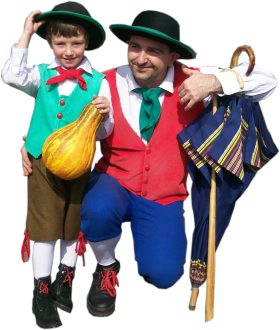 In winter the suit jacket integrates the costume with a cloth or "Tabar", characteristic black coat used to protect against the cold. 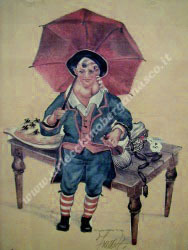 Complete the dress accessories such as the shepherd's crook and a multicolored umbrella. 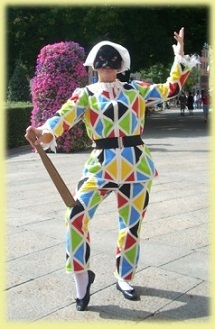 The clothes are then adjusted in detail and in colors as a tribute to Harlequin. 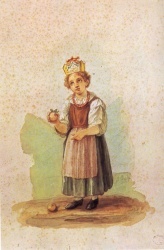 Other characters are represented such as Carolina (the maid of the mountain), the seller of chestnuts, the mask Gioppino, the knitter, the child crowned, the carpenter, the mine workers, the peasants of the valleys, all figures of the tradition. 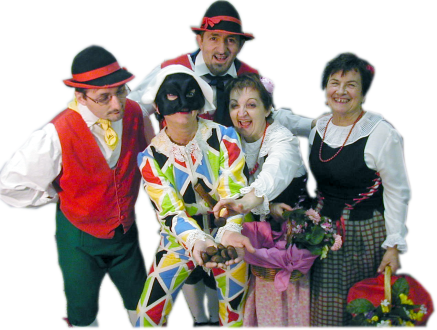 The dress of Harlequin is a traditional one described in the works of the "Commedia dell'arte" of Carlo Goldoni.